Gen. Jack Keane, former vice chief of staff of the U.S. Army, called the United States’ 16-year-long involvement in Afghanistan a “disgrace” and said some 10,000 to 20,000 additional troops were needed to win the war. Keane spoke with Fox News on Friday as reports surfaced the Pentagon will send roughly 4,000 additional American forces to fight a reinvigorated Taliban insurgency in Afghanistan. Defense Secretary Jim Mattis has not made an announcement on increasing troop levels in Afghanistan, but a Trump administration official told the Associated Press such an announcement could come as early as next week. Keane said the 4,000 figure is “only speculation at this point” and not enough to defeat the Taliban and boost the Afghan Army’s military might. The administration official told the AP that the bulk of the additional troops will train and advise Afghan forces, while a smaller number would assist in counterterrorism operations against the Taliban and the Islamic State. The Pentagon, meanwhile, told Fox News early Friday that no final determination has been made about sending additional troops. “No decisions have been made,” Pentagon spokesman Jeff Davis said. 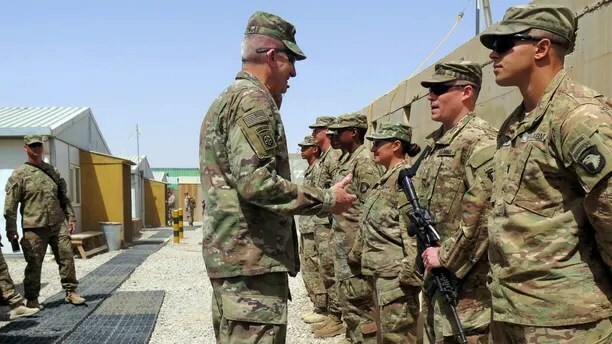 U.S. Army General John Nicholson, commander of Resolute Support forces and U.S. forces in Afghanistan, talks to U.S. soldiers during a transfer of authority ceremony at Shorab camp, in Helmand province, Afghanistan April 29, 2017. Picture taken April 29, 2017. If a few thousands troops are sent, they will be used in the same way the U.S. military is fighting ISIS in Iraq and Syria, officials told Fox News. Obama had set a cap a year ago of 8,400 troops in Afghanistan after slowing the pace of what he hoped would be a U.S. withdrawal. Keane, a retired four-star general who left active duty in 2003, placed blame on the previous administration for what he called a failure to change the momentum in the war. “It’s 16 years we’ve been involved in this war and it’s an absolute disgrace that we have not ended this war before, favorable to ourselves,” he said. Mattis told the Senate Armed Services Committee this week that the U.S. and its allies “are not winning” in Afghanistan. “We want a strategy, and I don’t think that’s a hell of a lot to ask,” McCain said. Keane also stressed it was critical to destroy Taliban safe havens in Pakistan, where he said the Pakistani military provides the network with intelligence on U.S. operations in Afghanistan.